I don’t read many mystery or thriller novels, so when I eventually do, I fall for every trick in the book. I end up suspicious of everyone, including the main character. In The Vanishing Year, Zoe seems to have the perfect life with her rich, Wall Street husband – but does she really, especially when her past life catches up to her? I was hoping for more excitement, but it took awhile for the story to ramp up. I shouldn’t be surprised since the beginning had to set up the story and red herrings. When the story did pick up, though, it was a roller coaster of suspense. For the life of me I could not guess the mystery. That’s not shocking though, as even when I used to watch CSI every week I never could guess the suspect. Apparently reading mystery/thrillers doesn’t really improve my deduction skills. I did not like Zoe’s husband Henry right off the bat. His character was developed so well that I felt the creep ooze off him. At times I often wondered how Zoe ended up so naive about him. Even though he spoiled Zoe with designer clothes and expensive jewelry his mannerisms always felt off to me. It made The Vanishing Year that much more interesting to read. Even though I didn’t figure out the mystery of the story until I read it I found it enjoyable to read. Despite the slow take off the plot twists had me shocked! I didn’t see any of them coming. I’m also thankful that there are no questions left unanswered. 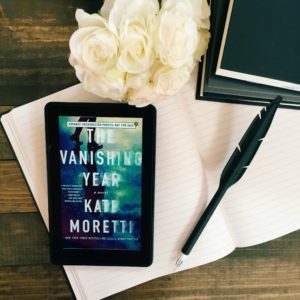 For my first Kate Moretti novel I will gladly read more of her books. You can order The Vanishing Year from Amazon or Barnes & Noble.